Superb quality and rare quartered oak Shapland & Petter of Barnstaple (stamped) writing cabinet on stand/secretaire, with drawers above and below. 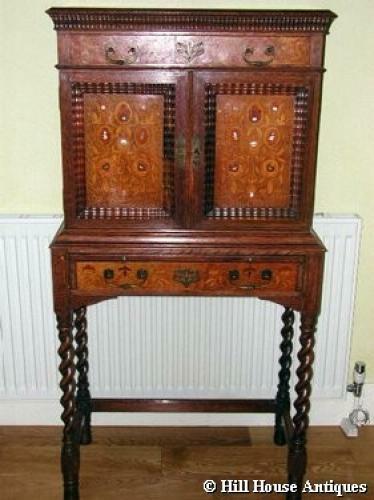 Richly inlaid with ebony, fruitwoods and mother of pearl to both front and also the inside stylised "peacock feather" panels. Nice little (signs of high quality) touches here and there including the top drawers of different widths but recess into one another on the inside. The whole just oozes quality throughout. A great neat compact size as well - would look beautiful anywhere! Approx 52" high, 25.5" wide and 14" deep. Circa 1900.